I was in Bernado class for almost 6 months. Sadly, because of work reason, I have to move. I have learned a lot from SwiftKick. I came in as a kickboxing background student and came out as a martial arts student. I have learned more defense skills, move technique, and kick skills. If I can stay longer, I believe I can learn more skills. All instructors are very nice and reachable. For adult class, your classmates are great instructor, too. We are so happy we signed our Liam up with Swiftkick Marital Arts in RB. We started 2 months ago with our 9yr old and he has made such great progress and actually loves going 3 times a week. If he is in a bad mood going he comes out of there super happy. He smiles through the whole class. We just signed up our 7 year old this weekend and he is so far loving it also. The staff are absolutely amazing with the kids. We are so grateful that we found Swiftkick Martial Arts. We were introduced by the after school program they offered on our schools campus. After just 7 weeks of training, through that program, we already saw a difference in our children’s behavior, attitudes and confidence. We knew we needed to continue. We appreciate the flexibility of the program and the great leadership offered by the coaches in each class. We now have all three of our kids in the program. We feel good about investing into their health, their character and their safety. My son has been practicing at SwiftKick Martial Arts for about two years. We have been nothing but pleased with the level of instruction, the professionalism of the teachers and staff, and the difference it has made in our son's life. We love how there are always many instructors available to help a child, give them a little motivation, or keep them focused. The teachers know all of the kids, by name, and they engage them personally by knowing who they are and what they are interested in. One thing I remember from our first day, was that Mr. Smith knew that my child was new, he knew his name and he welcomed him. That little personal touch can make an uneasy child more comfortable, that little thing, has stayed with me all this time and I think it is what makes SwiftKick so special. My 5 year old and 8 year old started at SwiftKick about a year ago and have loved it. I have watched them become more focused, gain strength and coordination and have fun doing it! About 9 months ago, my husband and I decided to join. I have become more confident and love the fact that I am getting great exercise and learning important self defense skills. There are plenty of class times to choose from throughout the week and all of the instructors are knowledgeable and kind. I would highly recommend SwiftKick for the entire family! Gain Confidence, Discover Self Defense, Get an Awesome Workout and Have a Ton of Fun with Adults and Kids of all Shapes and Sizes. Get Your First Class Free ($25 Value). GET YOUR FREE MARTIAL ARTS CLASS! 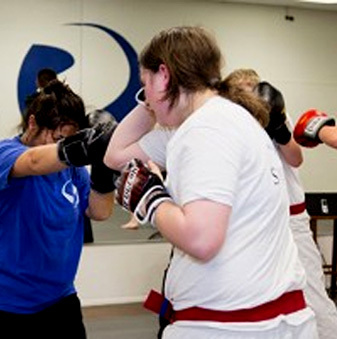 The SwiftKick Martial Arts Champions Program serves Adults ages 18 and up. SwiftKick Martial Arts San Diego is a Self Defense and Applied Martial Arts education program based in San Diego and Carlsbad. 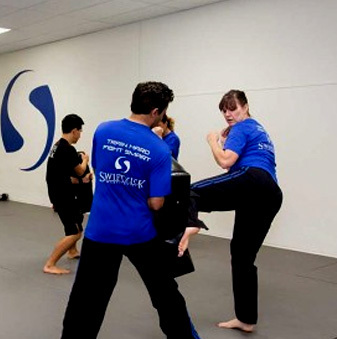 SwiftKick Martial Arts San Diego is not the typical martial arts gym or school. Our unique self defense classes focus on an approach that blends the best of mixed martial arts and combat self-defense to teach a highly functional and dynamic martial arts system. At SwiftKick Martial Arts we encourage our clients to become experts in practical fitness and self-defense. Our San Diego based martial arts program is also about integrating our martial arts training for increased success in business, education, and relationships. At SwiftKick we offer four core martial arts programs at our San Diego Martial Arts studio located in Rancho Bernardo and our Martial Arts Carlsbad studio. For Children (3-5) we have our Explorer program. For older children (6-11) we have our PathFinder program. For Teens (12+) we have our Impact program. For Adults (18+) we have our Champion program. 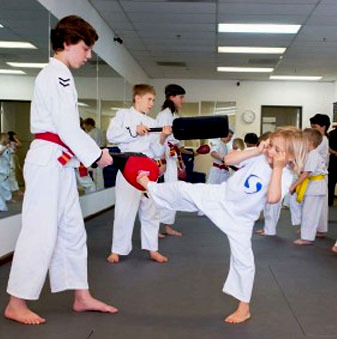 Each of these martial arts programs are designed to train students in Applied Martial Arts, a dynamic and integrated system focusing on functional martial arts, kickboxing, and self-defense. At SwiftKick, we value the martial arts to also be a life performance vehicle, something that can be applied to better yourself in all life pursuits. 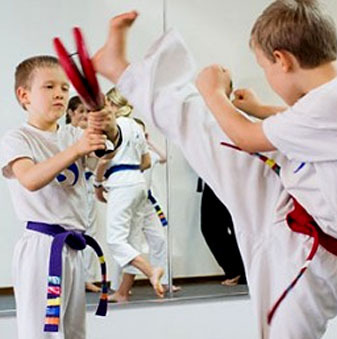 Swiftkick is a values based martial arts academy. My kids have attended courses for the last six years. I cannot say enough great things about the lead instructor and owner Brian Cowell. Our kids not only learn how to defend themselves, but they learn life skills, good values and discipline. I highly recommend anyone looking to build the right skills in their kids to send them to Swiftkick! Thanks Brian! I simply cannot say enough great things about Swiftkick. My son is a high energy, bouncy six year old and all of the instructors he trains with have been exceptional! Strong, kind, positive role models and the self defense and focus he has been learning is building his confidence on many levels. He just earned his orange belt and is utilizing what he’s learned in his interactions with kids and adults as well. He’s compassionate, tries hard and is working on all of the tenets he’s been learning since he started a year ago. I’d highly recommend Swiftkick to anyone who wants a fun, interactive and safe program for their kids. My kids love coming karate! My daughter started at the age of 3 and is now 6 1/2. She even broke her first board at 3 years old. My son started at 4 and is now 8 1/2 years old. They are always learning new techniques while perfecting the previously learned ones. They spend a portion of class learning/reinforcing good behavior which has been extremely beneficial. Brian is always willing to help with any issues kids are having outside of class. No matter how many other sports or activities we have, we always find a way to continue with karate. All of the instructors are very committed to the kids improving, feeling welcomed, and part of the team. As you can tell from all the great reviews, this is the place to train! Brian is a dynamic teacher and commented to passing on what he knows from the tots to the adults, and to his training staff. I have known Brian for well over 8 years and have trained on and off through the adult program for years. A year ago I started working nights in Hillcrest and was so grateful for the years of practical self-defense training I had received. Plus, it is fantastic exercise and great camaraderie. This is NOT an ego fighting club so you can train at your own intensity… but I mean who doesn’t want to punch something once in awhile? I took a self defense course from Brian Cowell and two of his other coaches after being assaulted on the street in front of my home in RB. It was such an amazing experience and I am so glad that I did it! Not only did I learn important self defense skills, but I also regained a lot of confidence in myself. I am 5’9, 136lbs and have to ask my roommate to open pasta jars for me, and by the end of the 3 hour class I could flip a 200lbs instructor off of me from my back. I so highly recommend Brian and his team for anyone looking to learn self defense, confidence, or martial arts. Thanks SwiftKick Martial Arts! Words can’t express how impressed I am with this place. My kid went to another place for two years before coming to this place. He has more coordination in the few months we have been here then the two years at the other place. David & Christopher are amazing teachers! They pay attention to each child to make sure they are doing things correctly. It’s not a belt factory as I have found with other places. You earn it here. They take time out to teach them lessons about respect & doing their best. I have seen so many positive changes in my kid. This place is a hidden gem! I have been attending classes here and truly love this unique approach to self defense. This program teaches you to be prepared using a multitude of styles from all the best martial arts. SwiftKick is the best program because it picks the best pieces from the top martial arts and wraps it into one program. I loved this program so much I just signed up my daughter….Brian and his instructors are all top notch! Our son has been attending Swiftkick for over six months now and we are very impressed. Not only do the instructors give special attention to each and every student, they are teaching them the tenets and instilling values that are invaluable. He will be testing for his orange belt next month. Thanks Swiftkick team! I only just began my training at Swiftkick about 4 months ago and I can say, without reservation, that this is the finest martial arts school I’ve ever trained at. The coaching staff is knowledgeable, friendly, and always open to feedback, and this is what truly sets it apart in my mind. Often I have visited other schools and observed a lot of instruction, but not always a lot of back and forth in regards to technique and helping bring a new student up to speed. This is not the case here, and it is what I truly enjoy about the instruction at Switfkick. The classes are physically challenging without being over baring, and the focus on getting in shape is a huge plus for me, since I have been out of the training cycle for many years. I have been meaning to write this review for some time now and it’s definitely both overdue and well deserved. I have been going to SwiftKick for a couple years and I have to nothing but great things to say about the owner and head coach Brian, the entire coaching staff, and their overall philosophy and approach to martial arts and self-defense training. It has truly been a life changing experience. I have lost 30+ pounds, gained so much confidence in my ability to defend myself and I’m having a blast in each and every class. My son has been going to Swiftkick Martial Arts for almost 3 years. He’s now 7 and still loves and enjoys the classes. He has 2 different coaches as he attends classes 4 times a week. Coach Jordan Egger is wonderful and knowledgeable; I can see why the kids enjoy his classes. Coach JT Smith is also as fabulous and wonderful and my son looks up to him. They each have a different technique in teaching but ultimately with the same goal!